We help Salons plan to Grow Salon Business by reducing cost of sales, increasing productivity and profitability, win more new clients, improve client retention and increase the life-time value of all clients. A 2% increase in client retention has the same effect on profits as cutting costs by 10%! 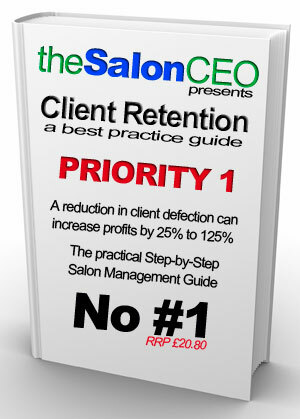 A 5% reduction in client defection rate can increase profits by 25-125%! 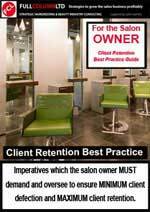 When you put client retention into the above context it becomes the salon owners No1 Priority. Most salon professionals take clients for granted and do not look for opportunities to increase revenue from their existing clients or to ensure client loyalty which leads to life-long retention. Read the Proof! and fix this. Our Client Retention Guide will aid management’s clarity and focus. The Salon Managers Guide is a straight talking step-by-step guide to managing the stylist-client work-flow routine’s that are required to optimise the in-salon part of the client experience and the client retention cycle. This book is a blue-print for salon managers to use as a strategy and a training aid to teach salon staff how to become more productive and more profitable and to take personal responsibility for developing their own column and winning more business. You the Salon Owner or Manager must give them the direction they need to achieve this. The stylists guide is their blue-print to tailor the client experience cycle for profitable column growth. Issue each stylist with a copy at a team meeting to study it at home. What will lift a salon team from good to great? A great leader knows that a cold hard business development strategy is essential to secure future salon business growth and the great leader knows that this can only be achieved with the full support of a hard working knowledgeable salon team. There must be congruence between all aspects of salon operations. What Makes a Good Salon Team Great? What makes a good salon team great has little to do with creative or technical ability. For sure your team needs to have good creative skills but this will only make them good at what they do. The great salon leader facilitates the team's ability to be good at it with more clients, more of the time to make more profit. So a great salon team is measured against the profit it makes not how creative it can be. Please do not be fooled by the simplicity of the above list. These five imperatives are key not only to future business growth but to the long term survival of the Salon Business. Within the five imperatives lie the secrets of salon marketing, increased sales, human resource management, staff productivity and client profitability. Creative salon staff need to be encouraged to become creative business development experts whom have the knowledge and ability to win more new clients and to extract optimum "profit-per-client-visit." Salon staff must be further encouraged to accept personal responsibility for the profitability of their own column. To this end salon management must measure profit-per-employee and act upon the results of this measurement if they are to generate increasing profitable revenue. This will only be achieved if the salon operates a viable staff performance plan designed to increase client numbers, productivity and retention. Most Frequently Asked Salon Business Questions! How can I win more new clients? How can I increase the average client bill? How can I get clients to visit the salon more frequently? How can I improve client retention? How can I get more clients to book on the day? How can I sell more retail without making the client feel uncomfortable? How can I increase prices without losing clients? How can I convert more clients to colour (instead of home kits)? How can I sell more treatments? How can I reduce and or make productive use of stylist down-time? Many Salon Managers struggle with staff who accept OK and "good enough" but simply do not have the time, knowledge or resources to do anything about it. Most salon staff only work to around 50% of their true potential and it takes practical human resources and Salon Business development know-how to put this right. If you're ready to take control of your salons future and make Salon Business development your number one priority then the Salon Managers Academy could be right for you. Considering that your staff are your most important "assets" IE the people who generate the money for your your Salon Business, would you not agree that your salon/s would be even more successful if each one of your stylists and therapists were highly motivated Salon Business Development Experts? The above is not a rhetorical question. Your staff are great hairdressers, technicians and therapists, they have spent years learning their craft in college, at manufacturers academy's and in-salon training and then they practice their creative skills each day at work. A salon that invests lots of time and money on creative training will have brilliantly creative staff, but may suffer from poor client retention and other business related problems if they have not invested equally in salon business development resources and training. "forward thinking today will make your salon profitable tomorrow"
The Salon Managers Academy provides the Salon Business Development training and resources needed to accelerate Salon Business growth and motivate the entire salon team to achieve the spectacular success that you intended when you first went into business. Membership of the Salon Managers Academy will open new profitable revenue building doors to salon owners and salon managers with a whole raft of Salon Business Development, Human Resources and Salon Marketing tools. Utilising our in-salon training and or distance learning tools salon management can begin to substantially increase salon staff productivity by teaching them how to accept personal responsibility for filling their own column and becoming more profitable team players. The online marketing world has already overtaken traditional business marketing. Membership of the Salon Managers Academy will give salon owners and salon managers access to online marketing training and discounted Salon Website Design and hosting.